The American Hosta Society registered this medium size (14 inches high by 32 inches wide) hosta from Japan with gold centered and green margined leaves in 1987. It was first identified by Dr. Fumio Maekawa around 1940. It has a lanceolate, moderately wavy and smooth textured leaves with thin substance which tends to make it attractive to slugs. Pale purple flowers bloom in mid-August. According to The Hostapedia by Mark Zilis (2009), this cultivar "...should be included on any list of hosta classics. 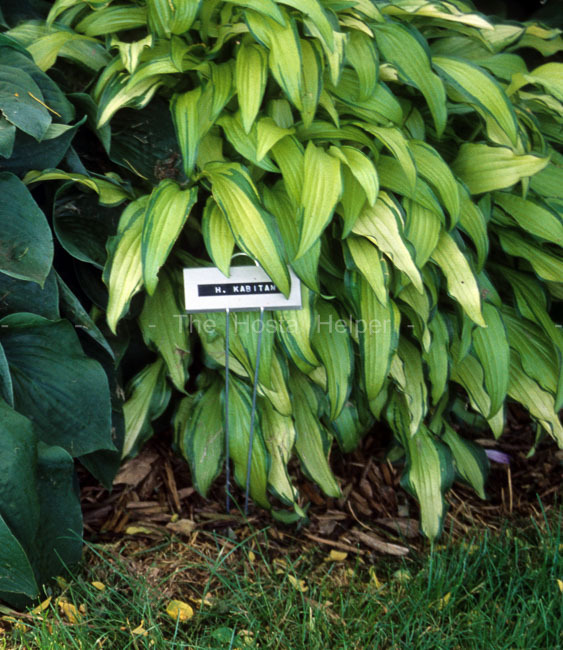 Though it lacks substance, it has been long grown in hosta collections and makes a great edging plant in shade gardens." Viridescence Emerging with yellow or whitish color that ultimately become increasingly green. An example is H. 'Fortunei Albopicta' whose green-bordered leaves have a beautiful, bright yellow-colored center in the spring that turns to green by midseason. Partial Viridescence Emerging with yellow or whitish color that turns to chartreuse (yellowish green), sometimes a dark chartreuse. One example is H. 'Kabitan'; two others are 'Golden Scepter'...and the center leaf coloring of 'Golden Tiara' . Lutescence Emerging green or chartreuse and turning yellow or whitish yellow. The coloring of leaf centers of 'Gold Standard' ...is an example. Albescence Yellow, yellowish green or green areas that turn to near white. Examples are the center leaf coloring of 'Janet'...and the margins of 'Antioch'...and H. ventricosa 'Aureomarginata'.